Electric Power Steering Kit - Which One To Choose? Electric Power Steering Kit – Which One To Choose? Over time you may notice your car’s steering becoming sluggish or it’s hard to turn the wheel. In instances like these you may have to replace parts of your power steering. To begin, you’ll need to diagnose the problem as this can help you know which parts you need to replace. You’ll want to inspect other components like your power steering hose or the electric power steering pump to make sure they are working properly. It’s important to note that accessing these parts is difficult as in most models they are buried under the engine. Therefore, you may want a trained professional to help you if you don’t have much experience. Once you determine the problem, you’ll know what to look for. When you shop for these accessories you’ll notice a huge selection available. Here are some tips to help you with this process. For starters, you’ll want to determine which steering kits you’ll need. If you have electric power steering, you’ll want to buy a pack that includes everything you need for the installation to be successful. There are many benefits to using electric power steering. For one, the system will deliver easy maneuverability, which will make the ride smooth and enjoyable for you. If you want to convert your ride to this system you can do so with an electric power steering conversion as there are many manufacturers that offer these kits. When it comes to the best electric power steering accessories available, you cannot go wrong with March Performance. 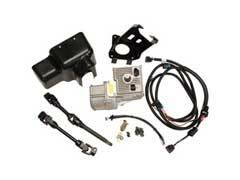 They make a variety of packages that include everything you need from brackets to kits. Their durable construction means each part can handle high torque and vibration thereby providing a smooth, steady ride for drivers. Best of all, their components are inexpensive, making this an affordable way to improve the handling of your ride. responsive handling, drivers will enjoy the smooth ride products from March Performance delivers. When factoring in the price, quality and overall performance of these items, it’s hard to go wrong with March Performance parts.